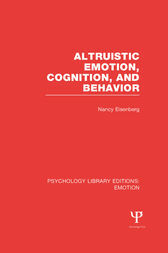 Originally published in 1986, this book was an effort to integrate thinking and research concerning the role of emotion and cognition in altruistic behaviour. Prior to publication there was a vast body of research and theorizing concerning the development and maintenance of prosocial (including altruistic) behaviour. This book focusses primarily on a specific set of intrapsychic factors involved in prosocial responding, especially emotions and cognitions believed to play a major role in altruistic behaviour. In the final chapters these intrapsychic factors are also discussed in relation to a variety of other relevant factors including socialization and situational influences on altruism.